Bindi Irwin Denies Derek Hough Romance After Australia Meetings: ‘DWTS’ Champ Still Dating Chandler Powell? 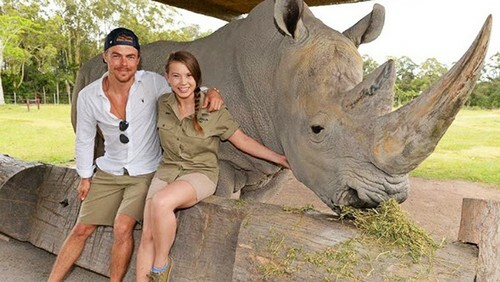 Bindi Irwin is denying rumors that she hooked up with Derek Hough during his trip to visit the new Dancing With The Stars champ. Bindi claims she and Derek are just friends following the DWTS win and that she’s still dating her wakeboarder boyfriend Chandler Powell. Rumors started again that Bindi and Derek might be more than just friends when the Australian tabloid New Idea claimed the Dancing With The Stars champs went public with their romance. This isn’t the first time rumors of a secret romance between the 17-year old Bindi and her 30-year old dance coach ran their course. Throughout the dance competition Bindi and Derek fought story after story that they were having some unprofessional feelings while rehearsing for Dancing With The Stars. Headline after headline accused Bindi’s boyfriend Chandler Powell of being jealous while she competed on the ABC hit. Bindi and Derek passed off their obvious chemistry as a brother-sister bond but almost no one believed them. Obviously Derek missed his newest DWTS champ because he couldn’t wait to see her again. Derek hopped a flight to Australia just two weeks after winning that mirror ball trophy and spent several days hanging with Bindi at the Australia Zoo. The dancing couple documented the whole trip on Instagram so it’s no wonder if Chandler Powell got jealous. Bindi often talks about her boyfriend on social media but Chandler was not mentioned while Derek Hough was in town. Derek and Bindi posted several pictures of them together during Derek’s Australia trip and they looked very happy to see each other. In one picture the glowing couple were posing in front of a rhino and they definitely were looking way more comfortable than “just friends” as they keep claiming. Derek and Bindi’s body language and chemistry in the photos was just as obvious as during the DWTS competition. The dancing partners are crazy about each other, whether they will admit it or not. If Bindi and Chandler are still dating as she claims, the 19-year old wakeboarder better keep his eye on his girl because Derek Hough just might sweep her off her feet for real this time. Bindi Irwin and Derek Hough Landing a DWTS Spin-Off Reality Show?